Model 929-B Rat Gas Anesthesia Head Holder is designed to provide a reliable means for stabilizing the head, allowing versatility to angle the head without obstructing the ability to deliver gas anesthesia. Custom arch mounted tooth bar provides head adjustment focused around ear bar zero. In addition, we have incorporated a custom nose clamping mask that can be utilized for delivering gas anesthesia. 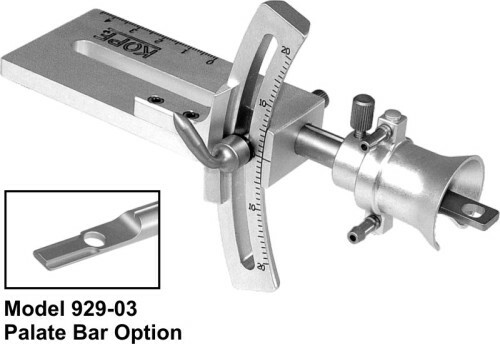 Model 929-B Head Holder can be ordered with Model 929-03 Palate Bar option for those applications which require stabilization of the head without the use of ear bars. Model 929-B compatible with 900, 1430 & 1730 series frames. Special order for 1530 series frame.